We associate political revolutions so often with men--Wyatt's Rebellion in 1554 (on my mind, since I just posted about Mary Tudor's coronation on 1 October) and the Essex Rebellion in 1601 may not be the kinds of revolutionary movements you're thinking of, since they involved disaffected aristocrats, but other "popular" revolutionary movements--like the English Revolution (of 1640), with Oliver Cromwell and the Parliamentarians, or the American Revolution or the Haitian Revolution or the various revolutions in 1848 or the Russian Revolution--are, more often than not, associated in our minds with men rather than women. But many women did participate in these movements. 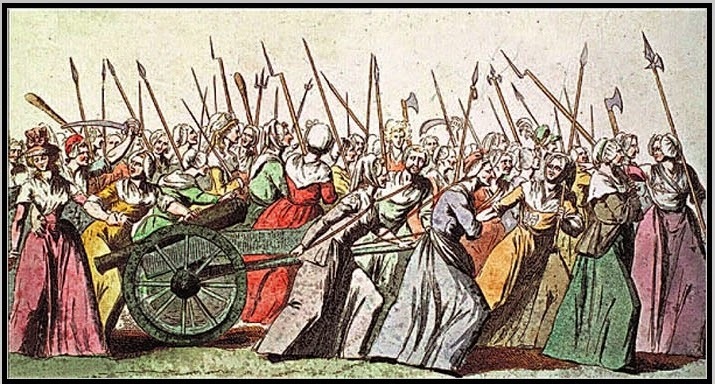 In fact, one of the earliest events in the French Revolution (1789-99) is the so-called Women's March on Versailles, which began on 5 October 1789. France had experienced years of poor harvests, notably in 1769, 1776, and 1783, but in 1788 a freak hailstorm had destroyed much of the harvest. An extremely cold winter and a scarcity of seed for the next year's planting meant another disastrous harvest in 1789, leading to high costs of all kinds of food, but especially bread, and to food shortages and scarcity. 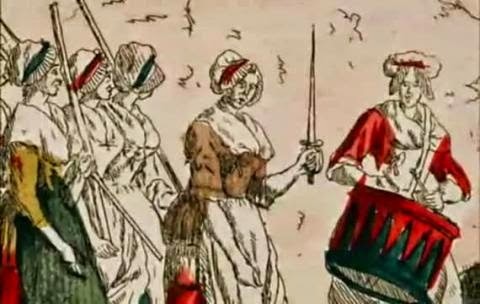 Women had been involved in various early revolutionary activities in Paris; they participated in electoral assemblies for the Estates General, for example, they were at the storming of the Bastille on 14 July 1789, and they took part in several demonstrations in the city. The march is widely attributed to "a group" of women, though the size of the crowd is certainly larger than what I usually think of as "a group." Estimates of the number of women involved in the march vary between five or six thousand and ten thousand. The march began when angry market women left Paris, but as they headed to Versailles, their numbers grew. The trip to Versailles--a little over thirteen miles--took about six hours, the marchers arriving tired, hungry, and soaking wet from the pouring rain. They met first with members of the French Assembly (they had to listen to their speeches! ), but then a small group of six women met with the king, who listened to them relate their struggle and suffering and then assured them that they would receive food. Some of the marchers left Versailles and returned to Paris, but others remained, and on the night of 5 October, they ransacked the palace, searching for the queen, Marie Antoinette, who was the focus of much of their anger. Both Louis XVI and Marie Antoinette appeared on a balcony before the rioters, the crowd's fury eventually quelled by the marquis de Lafayette (yes, that Lafayette). The next day, 6 October, the marchers, by then numbering perhaps 60,000, returned to Paris, accompanied by the king and his family in their royal carriage--the marchers had insisted that the royal family needed to relocate to Paris. In November of 1789, noting that the Declaration of the Rights of Man was just that, a demand for men to have rights, women addressed petition to the National Assembly asking that women be granted "the same liberty, advantages, rights, and honors" as men. Their petition was supplemented by six pages' of women's contributions to history. I will be posting next month about Olympe de Gouges--who produced her "Declaration of the Rights of Women and of the Female Citizen" in 1791. Challenging the revolutionary government--attacking them for ignoring women and demanding women's rights--did not end well for her. In the mean time, the Palace of Versailles website has a brief account of the Women's March on Versailles. Here is a link to noted historian Olwen Hufton's "Women in Revolution, 1789-96"--it's an essay from 1971, and it shows second-wave feminism's efforts to write women into history. There are several good books on women and the French Revolution, but you might like this English translation of Dominique Godineau's classic 1988 The Women of Paris and Their French Revolution, a great example of archival research.